By Ashton Hashemipour and Shravan Ravishankar / June 2, 2018, 12:30 p.m.
Chris Christie and David Axelrod in conversation at the University of Chicago on May 21st, 2018. 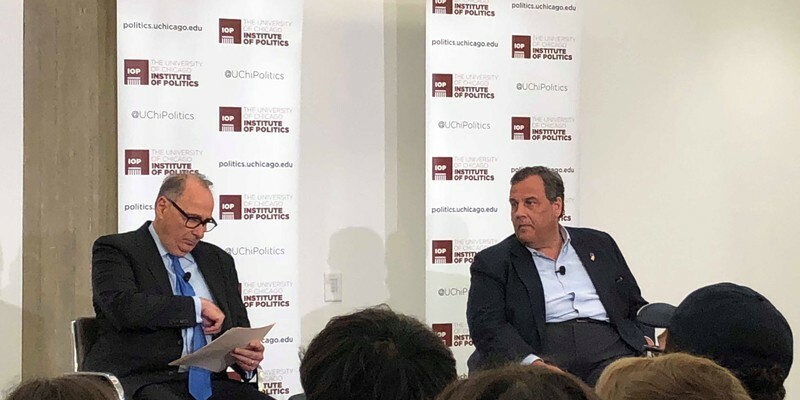 On May 21, the University of Chicago invited former New Jersey Governor Chris Christie, in conversation with Institute of Politics Executive Director David Axelrod, to speak before an audience of students and faculty. Christie covered a range of topics, including the Mueller investigation, his relationship with President Trump, and the malicious effects of partisanship in the United States before being asked a series of questions by students. Christie has had a long career in public service, serving as US Attorney for New Jersey from 2002 to 2008 and governor of New Jersey from 2010 to 2018. He additionally chaired the Republican Governors Association in 2014. After declining to run for president in 2012, Christie made a bid for the Republican nomination in the 2016 cycle before dropping out to endorse Donald Trump. He was soon named the head of Trump’s transition planning team, but was eventually ousted in favor of Mike Pence. In March 2017, he was picked to chair the President’s Commission on Combating Drug Addiction and the Opioid Crisis. On the topic of the Mueller investigation, Christie was quite clear in his opinions: he believes there have been personnel mistakes in the investigation but that Robert Mueller is a nonpartisan prosecutor carrying out an honest investigation. Christie expressed his disapproval of the agents who sent anti-Trump messages back and forth, but expressed his conviction that Mueller would conduct an above board investigation. Christie also clearly opined that Trump should not fire Mueller, given the facts of the investigation at the moment. Christie referenced his long friendship with the president, and stated that he still talked to the president about once a week. Christie prompted audience laughter when he asserted Trump was far less complicated than the press makes him out to be, quickly pointing out that “complicated” is not necessarily a positive attribute. He noted that thus far, Trump has made several unforced errors during his presidency, asserting that many of the “errors” of the transition period would not have occurred had Christie stayed on as head of the transition planning team. He emphasized that Trump’s personality drives his policies: Trump is obsessed with success and “repulsed by failure.” He pointed out that this defining trait may drive Trump to rethink his summit with Kim Jong-Un as the chances of visible failure increase, an accurate prediction of Trump’s letter to Kim, sent just days after the event, which stated that the United States would not be participating in such a meeting. Christie segued into a discussion on partisanship by mentioning the effects of his relationship with President Obama after Hurricane Sandy. Upon Obama’s arrival to New Jersey after the hurricane, he and Christie shared a very short embraced which caused uproar among Christie’s Republican colleagues. Their disillusionment with the New Jersey governor was only furthered after he stated, with the 2012 presidential election just days away, that Obama had been incredibly helpful during the aftermath of the hurricane. Christie noted that, though criticizing Obama after the hurricane may have helped the Republican cause, he was unwilling to lie for the political advancement of his party. He nostalgically remarked that these relationships have nearly disappeared from our modern political discourse and that it is imperative that federal politicians form these types of civil, honest relationships once more. Christie, however, did not seem hopeful that such a change would occur in the near future. Prompted by Axelrod, Christie mentioned that he had declined all six cabinet positions that the Trump administration has offered him. He stated that he possesses “enough titles” and would only play an official role in the administration if he felt morally compelled. That moment, he stated, came when Trump asked him to chair the President’s Commission on the Opioid Crisis. Christie lamented the lack of public discourse in regards to the crisis, mentioning that, unlike the AIDS crisis of the 1980s, there have been no marches, no protests, and no public visible care for those addicted to opioids. He further believes that the federal government is not doing enough to combat the crisis (or even taking the crisis seriously), citing the government’s refusal to address the epidemic as a “disease.” He mentioned that the greedy actors behind the epidemic—the doctors prescribing opioids, the pharmaceuticals not testing the opioids for harmful side-effects, and the Chinese, who are knowingly selling even more opioids to American consumers—have all played a role in worsening the crisis, which will only continue without meaningful intervention from the American federal government. Addressing a student question, Christie spoke about the future of American electoral politics. Though Trump has hit record levels of unpopularity, Christie does not doubt his ability to be re-elected. He mentioned that Americans view their elections as binary and if Democrats nominate a “Washington senator,” Trump will cruise to a second term. Christie claimed that—just as they were in the 2008, 2012, and 2016 elections—Americans are thirsty for change and, if faced with a choice between Trump, a self-proclaimed outsider, and a member of the Washington political establishment, they will elect the former. Image is courtesy of the authors. Ashton Hashemipour is a third year majoring in Political Science and Near Eastern Languages & Civilizations. Last summer, he interned in the Public Policy and Regulation division of Holland & Knight, a law and lobbying firm. Previously, he interned at Rep. Robin Kelly’s (D-IL) office. Outside of the Gate, Ashton chairs a committee for the university’s annual Model UN conference and is the Communications Chair for New Americans. In his spare time, he enjoys arguing with Aman, one of The Gate's Opinions Editors, about the legacy of Kobe Bryant and the Mamba Mentality, challenging his friends in basketball and FIFA, and discussing Iranian history from 1921 to the modern day.